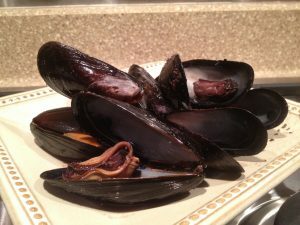 If you can get PEI (Prince Edward Island) mussels from the Bay of Fundy you’re in for a treat. If you can’t, just get a bag or two at the market. These were too easy to be as delicious as they tasted. Wish we had bought two bags of mussels instead one one. Note: Sometimes you’ll loose a couple mussels. You can tell if they are dead by banging them against the sink. If the open ones do not close, toss them. Pour wine and Antler Rub into a steam pot. Bring to a boil. Drop in Mussels and let them steam for about 5 to 8 minutes. When the open up they are ready! Discard any unopened mussels. Serve with melted butter and a loaf of crusty French bread. You can mix a little Antler Rub in the butter and spread on the French bread.